Home / Posts Tagged "Young Citizen Volunteers"
The enlistment registers of the 14th (Young Citizen Volunteer) Battalion of the Royal Irish Rifles, shows that despite the loyalist narrative that has sprung up around the 36th Ulster Division, there were a number of men who described themselves as Roman Catholic enlisting in the battalion. There were at least 88 Roman Catholics with addresses all over Ireland who enlisted in the Young Citizen Volunteer Battalion of the Royal Irish Rifles, of which 42 were from Ulster. Foundry worker William Kerr from Whiterock who was killed in action aged 22, Alfred Wynne who died aged only 18 from the New Lodge and Robert Dennison of Lisburn who died just 4 weeks before the end of the war. 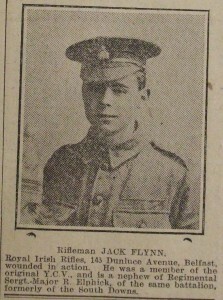 Two Roman Catholic RIC Sergeants lost their sons in the war, Crumlin Road Gaelic speaker Charles Blake died aged 24, while East Belfast’s Martin William Jennings died aged 21. Roman Catholic brothers who served include the Rooney brothers. Kilkeel born and Short Strand reared, only one would return home; Peter Rooney was killed on the first day of the Somme aged only 20. Widowed mother, Ernestine of Bangor was lucky to have both of her boys Raymond and Ernest Warnock home safe after the war despite one son being wounded. James Davey Maxwell’s father was a Scots Presbyterian from Glasgow and his mother an English Catholic from Liverpool. 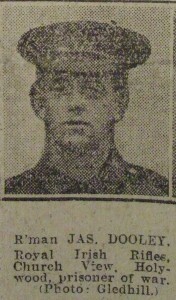 Their Catholic son James was killed in action at The Battle of Langemarck, aged only 20. Newly married Gaelic speaker, 18 year old John McKee from Armagh was killed in action in April 1918, his wife Cecelia placing on his gravestone ‘On His Soul Sweet Jesus Have Mercy’. Marksman William McGarrell of Dromore died of his wounds aged 21 in the Dressing Station, his body buried in Duhallow Advanced Dressing Station Cemetery. 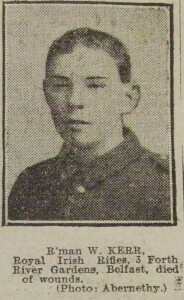 Ormeau lad James Magee served till the end of the war, being promoted to Lance Corporal. He was awarded the Victory Medal and the British War Medal, both of which were marked as returned. Another Ormeau boy to survive the war was 2nd Lieutenant James Redmond from Kimberly Street who served with both the YCV and the Royal Inniskilling Fusiliers. The 36th Ulster Division was made up of 107th, 108th, 109th Brigades, Divisional troops, mounted troops and artillery as well as Royal Engineers, Royal Army Medical Corps and other divisional troops. These Brigades included Royal Irish Rifles, Royal Irish Fusiliers and Royal Inniskilling Fusiliers. The 14th (YCV) Royal Irish Rifles was formed in Belfast in September 1914 from the Belfast Volunteers and came under orders of 109th Brigade in 36th (Ulster) Division. The battalion moved to Bundoran in December 1914 moving on to Randalstown in January 1915. In July 1915 they were moved to Seaford and in October 1915 they landed at Boulogne. On 18 February 1918 the battalion was disbanded in France and personnel re-allocated to other battalions of Royal Irish Rifles. “The 14th Battalion Royal Irish Rifles (Young Citizen Volunteers) left camp Randalstown yesterday morning, and marched via Crumlin to Belfast for the purpose of taking part in the review of the Ulster Division on Saturday. The men carried their rifles, packs, and entrenching tools, and notwithstanding the long distance they had covered – 22 miles – they appeared to be in excellent condition as they passed through the centre of the city at six o’clock in the evening on their way to the yard of Messrs. Davidson & Co. Ltd., Mountpottinger Road, where they piled arms and were dismissed. Lieutenant-Colonel R. P. D. Spencer Chichester, the commanding officer, rode at the head of his men, and the battalion band played appropriate airs. A large number of spectators witnessed the progress of the men through the city. The battalion was accompanied by its cyclist, signalling, and ambulance detachments, as well as by its transport. As the Unionist Centenary Committee marks the centenary of the Review of the 36th Ulster Division with a Parade past the City Hall on Saturday 9th May, it must be remembered that the 36th Ulster Division was not only made up of Protestants. People across Ireland enlisted in the war effort for various reasons, and there were at least 88 Roman Catholics with addresses all over Ireland who enlisted in the Young Citizen Volunteers, of which 42 were from Ulster. At least 8 Roman Catholic Ulstermen in the YCV gave their lives with the Ulster Division.